Proper planning and care is necessary to ensure that resident discharges from skilled nursing facilities are successful, and require involvement from the entire interdisciplinary team. Given the potential risk associated with discharges, federal regulations exist to help guide this process. This course will provide best practices surrounding the discharge planning process, including resident and family education. Identify consequences related to the lack of good discharge planning. Identify and explain 2 CMS regulations surrounding discharge planning. Describe the role of various interdisciplinary team members in the discharge process. 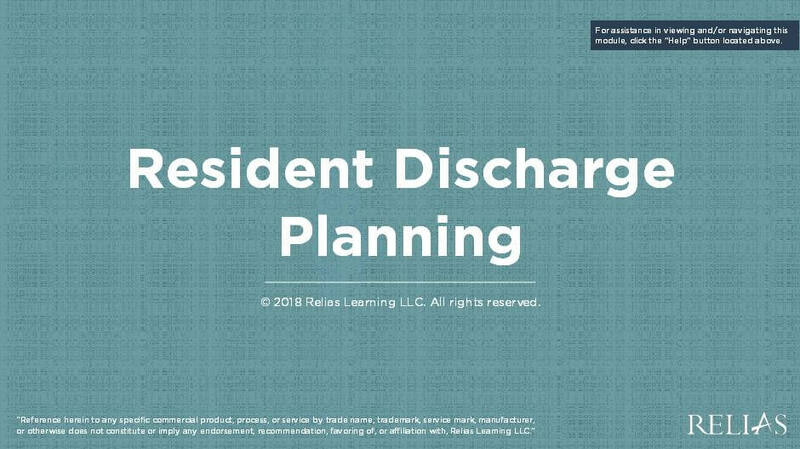 Explain the phases of discharge planning and elements required to be addressed for effective discharge. Identify documentation requirements related to the resident’s discharge summary. Adam Roesner, BSN has been working with various quality measures optimization since 2013. His experience in program management in both clinical and performance measures allows a unique perspective on the challenge faced by healthcare systems today. Adam has presented trainings on HCAHPS programs for sales forces and executive leadership alike, and has managed various skin health and HCAHPS educational programs and bundles for acute, post-acute, and IDN facilities. Disclosure: Adam Roesner, BSN has declared that no conflict of interest, Relevant Financial Relationship or Relevant Non-Financial Relationship exists. Ronald Orth, RN, CMAC, CHC obtained a nursing degree from Milwaukee Area Technical College in 1985 and a B. A. in Health Care Administration from Concordia University in 1996. Mr. Orth possesses over 30 years of nursing experience with over 20 of those in the Skilled Nursing industry. Mr. Orth has extensive experience in teaching Medicare regulations to healthcare providers both in the US and internationally. Mr. Orth is currently the Post Acute Care Curriculum Designer and is certified in Healthcare Compliance through the Compliance Certification Board (CCB). Disclosure: Ron Orth RN, CHC, CMAC, AHIMA-Approved ICD-10-CM Ambassador/Trainer has declared that no conflict of interest, Relevant Financial Relationship or Relevant Non-Financial Relationship exists. The target audience for this course is: entry level Social Workers; Nurses; in the following settings: Post-Acute Care.